After Class...with Sinclair Davis, Psy.D. THEMOMENT Champions, Once Again Gray Bees soccer celebrated its 12th national title last fall, after defeating The Pennington School in the State A Championship game on November 1, 2018. Ranked No. 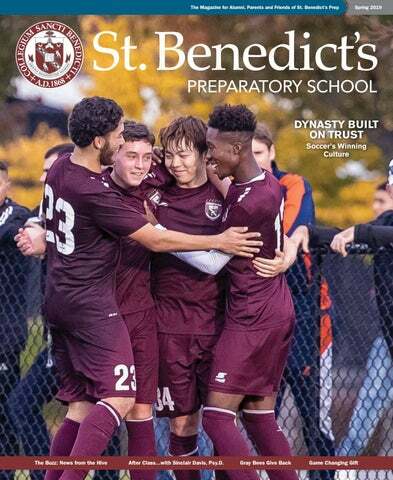 1 in the country by Top Drawer Soccer and in the USA TODAY/United Soccer Coaches Super 25 rankings, St. Benedict’s Prep finished the season with an 18-0 record, outscoring the opposition 109-4. When the season concluded, soccer’s storied program had a 37-game winning streak, captured back-to-back national titles and won its 29th state title in the last 30 years. The complete story about the teamwork, sacrifice and trust behind the St. Benedict’s soccer dynasty begins on page 4. Catch up with some of the people and programs that are making headlines at St. Benedict’s. The history, tradition and rituals that built a soccer dynasty and influenced the game. 8. After Class… with Sinclair Davis, Psy.D. Meet the new Dean of the Steven M. Grossman Counseling Center. John Allen ’54, Urb (Urban) LeJeune, Ed.D., ’51, Bob DiQuollo, CPA/PFS, ’65 and Chuck Schnabel, Psy.D., ’65 give their time at The Hive. The opening of the Cetrulo Family Fencing Center, and the Drama Guild stages Miss Evers’ Boys and The Passion of Dracula. The impact of a game-changing gift from the Grossman Family Foundation. Exchange Program Continues St. Benedict’s relationships with schools across the globe deepened as 15 students departed for Castricum, The Netherlands, on February 27. Students reunited with the Dutch friends they hosted here last fall, and the Gray Bees saw what home, school and community life is like in the land of windmills. This visit represents the third exchange between St. Benedict’s and the Jac P. Thijsse College in Holland. On March 17, The Hive welcomed eight students from the Amal School in Hadera, Israel. The partnership between the schools is in its second year, and students have been working together since last fall on a joint STEM-based project. The visiting Israeli students were treated to a generous serving of American culture while making the most of the opportunity for handson collaboration toward project goals. In April, St. Benedict’s heads to Israel for the second leg of the exchange. religious life with another community. While studying theology at Saint John’s University in Minnesota, he met Br. Simon Peter Clayton, O.S.B. ’08 and Br. Asiel Rodriguez, O.S.B., who were visiting from Newark. Over the next three years, Br. Mark will continue his prayerful service to Newark Abbey and the St. Benedict’s Prep community before taking solemn vows as a Benedictine monk. Br. Simon Peter and Br. Asiel are currently preparing to take their solemn vows in March 2020. CAREER NETWORK CONNECTS GRAY BEES Alumni from every generation at The Hive are reconnecting and expanding their professional network on GrayBeesConnect.org, a networking initiative launched by the Office of Advancement in 2017. Farad Lowther ’10, Advancement Officer and Director of the BIGS Career Development Center, oversees the network. “There’s a lot of movement on the website,” he said. “There are a ton of guys who’ve met, found mentors or are networking online.” Nearly 450 Gray Bees have registered for the network so far. The website was also recently updated with a sleeker look and greater functionality. our guys there to demonstrate is really powerful,” explained Dr. Cassidy. Founded in 2016, the Institute helps schools adapt St. Benedict’s best practices to their own organizations. More than 40 schools have reached out since August 2018 alone, and the Vox Institute maintains ongoing relationships with four schools — Kingdom Prep Lutheran High School in Wisconsin, Bluford Drew Jemison STEM Academy in Baltimore, Benedictine Academy in Elizabeth, N.J., and the Marion P. Thomas Charter School in Newark. Whether it’s mentoring middle school kids or advising administrators, Gray Bees take center stage. “We’re such a student-centered place that it makes sense to involve our students,” Dr. Cassidy added. “It really sets us apart. Other schools share models and reforms, but it’s all adults doing it. We tell our students, ‘All right, you guys tell us how to do this.’” For more information, please visit www.sbp.org/ academics/the-vox-institute. St. Benedict’s Prep Music Director Jeremy Fletcher, D.M.A., was part of the musical team nominated for a Grammy Award this year for West Side Story: A Masterwork Reimagined. The recording was cited in the Best Latin Jazz Album category. Dr. Fletcher arranged five of the 13 songs on the album, including the “Prologue,” “Gee, Officer Krupke,” “One Hand, One Heart,” “Somewhere” and the “Epilogue/Finale.” Dr. Fletcher has worked at St. Benedict’s since 2008. A graduate of Carnegie Mellon University, he holds two advanced degrees — a master of music in jazz composition and a doctor of musical arts in jazz arts advancement — from the Manhattan School of Music. West Side Story: A Masterwork Reimagined celebrates the 60th anniversary of the hit Broadway musical and film, both of which featured an original score by Leonard Bernstein. Eight-time Grammy nominee Bobby Sanabria sought to rearrange Bernstein’s score with a Latin jazz influence, and performs on the new recording with his 22-piece Multiverse Big Band. DYNASTY BUILT ON TRUST Few were surprised when the St. Benedict’s Prep varsity soccer team capped a perfect 18–0 season with its sixth national championship in eight years in November 2018. Winning is only one part of the School’s celebrated reign. For more than 30 years, St. Benedict’s has dominated the game by building a championship culture based on trust, perseverance and teamwork. History The ascent of soccer is inextricably tied to the history of St. Benedict’s Prep. Faith, along with Newark Abbey’s commitment to stability of place and community, provide the foundation to build the unified team with a championship mindset. AN INTRODUCTION OF IMMENSE PROPORTIONS It was 1984. “St. Benedict’s should have a great soccer team, and I’ve got the guy to coach it,” Mike Gerson told Headmaster Fr. Edwin Leahy, O.S.B. ’63. Gerson was a good friend to Fr. Ed and The Hive. “The guy” was Rick Jacobs H’90, who went on to guide St. Benedict’s soccer to six national championships and 23 state Prep A crowns from 1985–2009. Under Jacobs, St. Benedict’s had a 519–27–13 record and emerged as the nation’s leading soccer program. Headmaster Fr. Edwin Leahy, O.S.B. ’63 remembers the program’s origins in the mid-1970s. Back then, a dynasty seemed unimaginable. “We were looking to add more activities for the kids,” Fr. Edwin explained. “We didn’t have the money to support an American football team, so we decided to try soccer.” The program didn’t come into its own until Tab Ramos ’84 (see sidebar page 7) enrolled at St. Benedict’s and led the team to its first state tournament in 1982. By then, the Headmaster had a vision for soccer and athletics writ large. “You have to understand that in 1973 and 1974, I watched our basketball team get destroyed,” said Fr. Edwin. “I swore our kids wouldn’t get steamrolled like that again in any sport, because that’s what happens to them in life. If we were going to compete, we were going to have our kids compete at the highest level, given their talents.” HISTORY. TRADITION. RITUALS. Enter Rick Jacobs H’90. He was up for the task, though he inherited what he calls “an amalgam of players” in 1985. The first team meeting established the tone for Jacob’s 25-year tenure: he asked the players to define their goals. “We had 20 games that first season,” Jacobs explained. “I asked each guy to write how many games they thought we could win.” Some players wrote five — the number of wins the previous season — while a few hoped to achieve 10 victories. Jacobs wrote 20-0 on the blackboard and challenged his team to envision an undefeated season. “That set the stage for hard work, trust and raised expectations,” recalled Jacobs. The building blocks he used to create a championship culture — history, tradition and rituals — aligned perfectly with the ethos of the School. “I thought St. Benedict’s was the perfect place to stand on the shoulders of the monks and their unbelievable faith, commitment to stability of place and living in community,” said Jacobs. “It was a natural conduit for me to deliver the message that history is important to St. Benedict’s soccer — history that was written in the past, as well as history being written today.” Jacobs introduced traditions and rituals that continue to this day. He gave his players tennis balls on which they were to inscribe their initials and phrases or words important to them. They then had to carry the balls everywhere for the entire season. This ritual became a tradition of epic proportions. “We had one team of 27 guys representing 16 different countries,” Jacobs said. “Guys would bring the tennis balls to each practice and game, line them up and, during the course of the warm-up, raise them in unison. This was their way of saying, ‘We’re together. We may be different, but we’re the same.‘” At the end of Jacobs’ first season, the team finished 163-2. St. Benedict’s won its second state championship the following year and a soccer dynasty was born. Camaraderie thrives on the soccer field. Tab Ramos ’84 Ramos, is still New Jersey’s alltime leader in goals scored (161) while a Gray Bee, who went on to represent the United States in three World Cups, was enshrined into the National Soccer Hall of Fame in 2005 and currently the coach of the U.S. Under-20 National Team, leading them to the CONCACAF title in 2017. Gregg Berhalter ’91 Berhalter, a veteran of two U.S. World Cup teams, played overseas for 15 years before becoming the first American ever to manage a professional team in Europe when he coached Swedish club Hammarby IF. He returned stateside to coach two Major League Soccer teams before being named coach of the U.S. National Team in December 2018. Claudio Reyna ’91 The Gray Bees went 66-0 with their superstar in the lineup and captured national title No. 1 in 1990, while garnering two-time National Player of the Year honors. He went on to win three NCAA titles at the University of Virginia, where he won the Hermann Trophy as the top player in the nation (1993) before playing professionally in Europe, while doubling as captain of the U.S. World Cup team. Reyna, who is regarded as the best-ever American player, is the current Director of Football Operations for New York City FC. I want these kids to realize their potential. As a kid from this city who couldn’t envision life past the age of 25, I want our kids to be able to envision themselves doing something major and have a path to get there. Most lives don’t change that dramatically over the course of a decade. Sinclair Davis’s did. In 2009, he returned to Fairleigh Dickinson University to finish a bachelor’s degree. Today, he’s a Doctor of Psychology and the Dean of Counseling of the Steven M. Grossman Counseling Center. Dr. Davis recalls his journey in academia and how his own life experience mirrors the lives of the students he counsels. And what happened? I started doing things as a student I had never done before. I paid attention and raised my hand in class. Arranged to see professors during office hours. Read more. I made a promise to myself, “Don’t quit, no matter what happens.” I started getting a little more comfortable. Then, I did badly on an exam in abnormal psychology. I thought I was done and wanted to quit that day. I ran into a student who convinced me to stick around until the end of class. Sitting there, I was so angry and frustrated. But I thought, “Look, you said you weren’t going to quit. Study harder.” I went into this crazy study mode and long story short, ended up with an A minus in the course. Not quitting was a very big thing for me. It was a bad habit, but it was comfortable. I had to get comfortable with new habits like working my way through things. When did you get interested in psychology? I was always interested in psychology. When I had the chance to go back to school, I wanted to learn why people believe the things they believe. Why are they important? Why do people have certain behaviors? What causes them? Can these behaviors be changed? I was very curious about these things. You first came to St. Benedict’s as a graduate intern in 2014. How well did you know the school? I didn’t know anything about this school. But I had two professors who recommended St. Benedict’s. I was kind of nervous when I started. Two days a week as an intern turned into doing my fifth year practicum here. And every day, I got more comfortable with the culture and how the School is run. remember being a kid walking downtown after school not knowing what was going to happen. Are the lights going to be on when I get home? Should I go to my friend’s house for the weekend? I lived that for many years. I don’t know what a kid may be feeling, but I understand what he’s dealing with. That helps you come down to where kids are. Meet from there and move forward. That’s huge. What do you perceive your mission as Dean of Counseling to be? What we’ve always done is help kids respond to their emotions appropriately. Recognize them and respond to them appropriately. That’s pretty much the basics of what we do. I definitely want to take what’s been built and get it to where every kid who needs assistance — whether it’s academic, social or emotional — can get what they need without having to go outside the School. I want these kids to realize their potential. As a kid from this city who couldn’t envision life past the age of 25, I want our kids to be able to envision themselves doing something major and have a path to get there. The center is now officially known as the Steven M. Grossman Counseling Center. How does the support of the Grossman Family Foundation impact the work being done here? It allows us to stay current. And you have to stay current to be able to assess students efficiently, accurately and appropriately. Screenings and assessments for academic or social-emotional issues get updated all the time. These resources are not free. Our students can receive treatment, and have access to resources that everyone else has. We’re able to provide top-notch services and assistance regardless of a family’s situation. Our kids have ability. They just need guidance. I want our kids to play big. Granted, there’s a lot to unravel before you get to that point. But I want them to be able to experience what it’s like to play big, and lose sometimes, but then get victories, as well. I would not be here today if it was not for the courage and willingness to play big. Sinclair Davis, Psy.D., holds a bachelor’s, a master’s and a doctoral degree in psychology from Fairleigh Dickinson University (Metropolitan Campus). A New Jersey certified school psychologist, Dr. Davis joined The Hive full-time in 2016, and was appointed Dean of Counseling at the star of the 2018-19 academic year. His dissertation on the Unknown Sons counseling group at St. Benedict’s contains important insights for psychologists and others who study the impact of absent fathers. Read the online story at www.sbp.org/SpringMag/Davis. John Allen ’54 helps David Decker ’21 with his geometry homework. WINTER SPORTS WRAP-UP The indoor track program rewrote the Gray Bee record book – setting new school standards in the 4x400-meter and 4x800-meter relays, 600 meters, 800 meters, 1000 meters, and the shuttle, 60 & 55 hurdles. The basketball team, despite winning 25 games, missed a State Prep title for only the second time during the tenure of Coach Mark Taylor, who is inching closer to the 500-career-victory mark. The wrestling team, behind first-place efforts by Ibrahim Mendheim ’20 at 145 pounds and Christian Chajon ’19 at 285 pounds, sent a dozen wrestlers to the National Prep Championships at Lehigh University. All 12 wrestlers finished in the top four in the national qualifier at Blair Academy to get an automatic berth into the Prep Championships. The swimming team wrapped up its season in the Eastern States Championships and scored 36 team points, the most by a Gray Bee team since 2002 when future Olympic Gold medalist Cullen Jones ’02 wore Garnet and Gray. Scenes from Miss Evers’ Boys staged in November 2018.
the Pulitzer Prize in 1992. The 1997 adaptation of the play for HBO was nominated for 11 Emmy Awards and two Golden Globes. And in March, The Drama Guild turned to spooky comedy with The Passion of Dracula, based on the novel by Bram Stoker. In the play, Dracula has traveled from Transylvania to England in search of a bride who will provide him with an heir. He chooses the ward of a doctor who runs a sanatorium for the insane. The doctor’s friend, a specialist on vampires, travels to England to pursue and ultimately defeat Dracula. Scenes from The Passion of Dracula staged in March 2019. St. Benedictâ&#x20AC;&#x2122;s understands that student success is more than receiving a high quality education. In addition to a solid education, they provide the guidance and social emotional resources that enable students to achieve success both academically and in life. For more information, visit sbp.org/forever. 1983 SHARE YOUR GOOD NEWS! 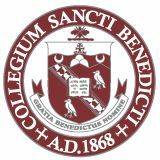 St. Benedict’s welcomes any and all news about your career, education, family life and reconnecting with other alumni. Submit news via email to graybee@sbp.org. 1949 Richard Ragold is still spending some time in consulting engineering, but more time playing golf, fishing and doing watercolors in beautiful northern Virginia. 1958 J. Healey, Ph.D., of Monroe, N.J. has been selected by the Rutgers Alumni Association as a recipient of its prestigious “Loyal Son of Rutgers” award. John is one of only six recipients of the Loyal Sons & Daughters distinction in 2019. The honorees will be inducted during a “scarlet-tie” affair to be held at the Hyatt Regency in New Brunswick, Saturday, April 13. A 60-year tradition, the Loyal Sons & Daughters of Rutgers comprises individuals who have made a meaningful and long-standing contribution to the betterment of Rutgers by performing extraordinary volunteer service or by making a significant impact on university life and culture. Among his many accomplishments, John has also established a link between the Rutgers School of Engineering and St. Benedict’s, providing support for current SBP students who seek to pursue an engineering career, and strengthening the STEM Program at The Hive. anniversary of his priestly ordination on March 22 with a Mass on March 23 in the Abbey church. He also marked it with the publication of his seventh book of meditations, published by Liturgical Press, entitled Faces of Easter: Meeting the Paschal Mystery in the People Around Us. Trenton, and Camden in Jim Waldron’s honor. Jim served as Clerk of the Court from 1984 to 2017. The ceremony took place February 21 at the Frank R. Lautenberg Courthouse in Newark. Below are Darren St. Ange ’11, Bernard Greene ’73 and Jim Waldron at the ceremony. 1967 Greg Thornton again joined the company at the Orlando Shakespeare Theater, appearing in Hamlet and Gertrude and Claudius. The season ran from February 6 to March 24, 2019. 1981 Tim Dalton reports that he has been caring for his brother, Jack ’72, who had a stroke in 2016, and their mother. His son, Jack ’07, has been busy working a federal law enforcement job and is commander of a company of New Jersey National Guard soldiers. Jack got married to Emily Dalton in January. Currently, Jack is leading a deployment of National Guard soldiers to the Horn of Africa. He is pictured below at the deployment ceremony speaking to his troops February 4 in front of Gov. Phil Murphy, Senators Cory Booker and Robert Menendez. 1987 Kevon Chisolm, a trademark attorney in the United States Patent and Trademark Office, received the Bronze Medal Award for Superior Work Performance, including an outstanding rating in quality performance. shows the Eisape family at the Cross and Crown induction. From left: DeeDee, Seun ’20, Tiwa ’15 and Adebayo ’12. pounds, 8 ounces and 20.5 inches. 2006 Kunle Samuels announced his engagement to Isi Igbinedion at Christmas. Marta and David Rodriguez ’96 welcomed a son, Santiago, on January 10. Santiago joins big sister, 2-year-old Sofia. 2011 Roberto Abrantes and Jenny Abrantes have been married for four years; they have three children, and recently purchased their first home. MARRIAGES Torian Easterling ’99 married Diane Easterling in November 2018. Darren St. Ange, a third year law student at Seton Hall Law School, is President of the Student Bar Association there. 2012 Adebayo Eisape is finishing a Ph.D. in computer engineering at Johns Hopkins University, his alma mater. Sharon and David Carlo ’99 welcomed their second child, Milena Mei Ye Carlo, in October 2018. Imani and Naji Curry ’12 got married in July 2018. 2014 Darian Richmond-Toms and Ashley Cradle are engaged. Mone’Kai and Frantz Soiro ’12 got married in August 2018. Aliyah and Husain Gatlin ’03 announce the birth of their son, Malachi Ahmad Gatlin, in September 2018. He weighed 7 pounds, 14 ounces. Missy and Bill Leahy ’04 had their second child, daughter Scarlett Reese Leahy, on September 11, 2018. She weighed 7 pounds, 3 ounces. She joins a big brother, Jackson Dalton Leahy. Gabriel Leonard ’04 and his wife, Alla, welcomed their second child, Zachary Ernest Leonard, in December 2018. For the past 20 years, Mike DiPiano Sr. H’82 has worked tirelessly to spread an important message: organ donations save lives. He should know. In 1998, the former St. Benedict’s Athletic Director and Wrestling Coach received a kidney and pancreas transplant from a 21-yearold man killed in a car accident. Since then, Mr. DiPiano has sought ways to honor his donor’s memory and encourage others to consider organ donation. One of those initiatives was the ninth annual Gift of Life Wrestling Duals, held at The Hive on January 12. Each year, several area high schools face off on the mat, and the Sharing Network is on hand to provide information on organ transplants. “If organ donors weren’t a thing, I wouldn’t even be alive right now,” Mr. DiPiano, the father of Mike DiPiano Jr. ’95 and Frank DiPiano ’01, told the crowd. Above: Mike DiPiano Sr. H’82 speaks to the crowd. Left: Wrestlers prepare for a match. Events ON THE ROAD AGAIN Headmaster Fr. Edwin Leahy, O.S.B. ’63 and Chief Advancement Officer Mike Fazio joined alumni supporters in Florida in February and March to spread good news from The Hive. With stops in Bonita Springs, Naples, Tampa, Vero Beach and Pompano Beach, Fr. Edwin said, “I love being here visiting our guys and other friends in Florida and around the country, but I hate getting here. I always give Fazio (Chief Advancement Officer Mike Fazio) a hard time as he drags me around from airport to airport. It’s tough being away from the monastery and the kids back at School. But once I’m here, with you, it’s great. It energizes me.” Lunch was hosted by Paul Hannan ’56 at the Rusty Pelican in Tampa, Florida. Don Laurie ’60 and his wife, Susie, hosted an alumni reception for Fr. Edwin Leahy, O.S.B. ’63 at their home in Vero Beach, Florida. Gene O’Hara ’55 hosted the Gray Bees for an evening reception at the Bonita Bay Club in Bonita Springs, Florida. May 31-June 2, 2019 For information, contact Candace Bradsher at (973) 792-5752 or candaceb@sbp.org. The Breakers Spring Lake, N.J. A special event for alumni who graduated 50 or more years ago! For more information and reservations, contact Mary Hauck at (973) 792-5776 or mhauck@spb.org. ALUMNI COMMUNION BREAKFAST The Alumni Association’s Annual Communion Breakfast was held on Sunday, March 31, beginning with a 9 a.m. Mass in St. Mary’s Church and followed by the breakfast in St. Benedict’s cafeteria. Honored this year were former teacher at The Hive Richard Lorenzo ’63, Distinguished Alumnus; Director of St. Benedict’s Vox Institute Glenn Cassidy, Ed.D., ’90, Distinguished Monk/Teacher; St. Benedict’s Security Staff member, Reginald Baskerville and St. Benedict’s Facilities staff member James McKerry, Honorary Alumni. From One Gray Bee to Another By Matthew Achariam ’07 Hon. John J. Gibbons, Esq. ’42 was a legal giant. The former chief judge of the U.S. Court of Appeals for the Third Circuit left an indelible legacy when he passed away on December 9, 2018 at the age of 94. He recruited attorneys to represent hundreds of citizens detained during the Newark riots of 1967 as president of the New Jersey Bar Association and rendered 800 opinions during his 20-year tenure as a federal judge. After Judge Gibbons retired from the bench, he successfully argued for due process of detainees at Guantánamo Bay Naval Base before the Supreme Court, and led the effort to abolish the death penalty in New Jersey. Missing from this long, distinguished record of public service is the advice, support and guidance Judge Gibbons freely gave to Gray Bees through his law firm, Gibbons P.C. Matthew Achariam ’07 was one of many who benefited from the late judge’s kindness. He shared this remembrance: Shortly before Christmas, I sat in one of the packed pews of St. Rose of Lima Church in Short Hills for the funeral Mass of Judge John J. Gibbons, learning and absorbing the full scope of the kindness and the outsized impact he had on the lives of those around him. My family and I are lucky to be counted among those whose lives he helped change for the better. The first time we met was several months prior to my graduation from the Hive in 2007. He welcomed me to his office the moment he had heard from St. Benedict’s that I had trouble getting financial aid for college due to the nature of my immigration status. I was quite nervous to attend this meeting, having heard so much about Judge Gibbons, but that nervousness was quickly dispelled by his warmth and calm demeanor. In our short meeting, he seemingly made up his mind to help me—moving mountains to get me a full scholarship to The College of Holy Cross. Shortly after, a lawyer at his firm, Susanne Peticolas, took on the arduous task of getting my family green cards, again at no cost to us. Over the next six years, she was relentless in filling out all the tricky paperwork and forms required to get us permanent residency. Judge Gibbons had managed to surround himself and work with the people who had the same propensity for kindness and generosity. Several of his family members shared wonderful stories that helped me understand his role as a father and grandfather. It was unsurprising to learn that many of them had been inspired by him to take on the mantle of giving back through jobs in public service, social work and law. The last time I met him was a year after I had graduated from Holy Cross. I had reached an inflection point in my career and Judge Gibbons had unhesitatingly offered his counsel. I had been considering law school and once again, without hesitation, he said he would help in any way he could. It’s hard to forget or describe the positive impact of his unwavering belief in me when I was unsure of myself. The passing of time has a unique way of emphasizing and muting the many memories of life. It takes a special kind of person to create beautiful memories in the lives of those around them, as Judge Gibbons did for us. Leaving the church that day I couldn’t help thinking the greatest lesson from his life was the sense of duty to pay it forward—and that is how I want to honor his memory. Matthew Achariam graduated from The College of Holy Cross in 2011 with bachelor’s degrees in Chinese language & civilization and computer science. A product designer in the software industry, he recently co-founded the software company Clay. — an 11-month school year, student-leadership, experiential learning, counseling and emotional support for 40% of our students — are here forever. Forever begins now and it depends on you. Nearly 8,000 loyal alumni and friends have already raised more than $68 million toward our ultimate goal. Be a part of this historic Campaign and make your gift today! Visit www.sbp.org/forever. For information on sponsorships or journal ads, please contact Candace Bradsher at (973) 792-5752 or email graybee@sbp.org.